Archdale, North Carolina, USA, July 19, 2017 – Häfele is always thinking about your individual project and what you need to get the job done. Our goal is to provide you with everything you need, from the large pantry pullout to the safety glasses that protect your eyes. We know what craftsmen are going through and what they need to do the job right. This is why we at Häfele continue to add tools and consumables to our product ranges: so it’s easy for you to take your project from start to finish with us. 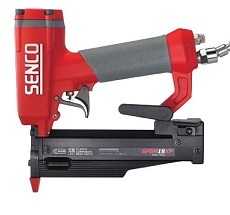 The all-new SENCO Composite Fastening System means no more wasted time, marred surfaces or damaged equipment. Whether used for cabinets, decorative trim or furniture—these plastic composite fasteners can be machined like the material it is driven into without damaging the piece or your tools. Totally steel and metal free, this product eliminates clamping tools and screws and can be painted, stained, cut, routed and sanded. Häfele now offers a wide variety of cabinet hardware jigs and drill jigs making it easier to install our products. From cabinet hardware jigs with extra extension bars to drill jigs for Free flaps, Free foldfittings, Loox LEDpuck lights and more, these jigs help you get the job done. Whether at home, in the shop or on the job site, we know you rely on extension cords day in and day out. Our all-new selection of 12 gauge, 3 conductor, 15 amp extension cords are designed to do just that. And much more. The Bulldog Tough Extension Cord is available in 25, 50 or 100 ft. Water, oil and abrasion resistant, flame retardant and flexible in temperatures from -58 to 221 F. A convenient Primelight® indicator light shows when the power is on. Safety glasses, gloves, cooling towels and particulate respirators—these products have been added to our product lines to keep you safe and comfortable. We have new safety glass options such as Diamondback and NSX Turbomodels which feature stylish, wrap-around protection. LED Inspectors safety glasses add built-in LEDs allowing you to easily see your work. We also now carry Raven and Astro-Gripgloves which keep your hands free from debris while still allowing you to grip. Our all-new Particulate Respirators are more comfortable to wear and offer 95 percent respiratory efficiency in non-oil areas. Lastly, our new Cooling Towel helps keep you comfortable, no matter the work environment.